Our tower call sign is ‘Thruxton Radio’ on frequency 118.280MHz. RW25/07 Asphalt 770x23mtrs, RW 30/12 Grass 750x31mtrs. Fuel 100ll, JET A1 Thruxton Radio 118.280! Thruxton airport is situated 5 miles west of Andover just off the A303. There is one hard runway and a grass runway situated inside the Thruxton Race Circuit. Having the benefit of a hard runway there is never a problem getting in and out of Thruxton – however long or however hard it rains – so it is ideal as a base, particularly for heavier twin engined aircraft. We have an extension to the runway up to 820mtrs. 07 LH, 25 RH, 12 RH, 30LH. Unless otherwise advised by A/G, all circuit heights are 800ft QFE on weekdays or 1000ft QFE after 1700 GMT and weekends. No deadside on 07/25 due to helicopters on south side. 07/25 downwind leg must be to the north of KimptonVillage and the large new house. Avoid overflying red hatched areas as shown in the image. Aircraft are to be operated in a manner to cause least disturbance in areas surrounding the aerodrome. The nominal circuits shown in the image are required to avoid noise sensitive areas. 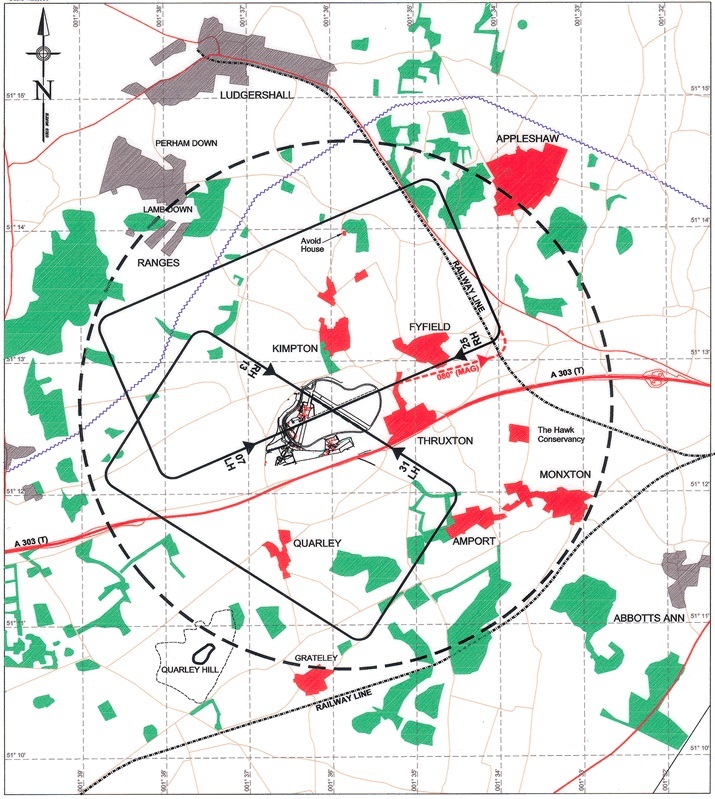 All departures from runway 07 should turn right at the aerodrome boundary to maintain a track of 080 degrees (MAG) until clear of the village of Flyfield.